Who could have estimated that an ordinary music festival could become such a legendary and iconic landmark of the 1960's? The 1969 Woodstock Festival was a three-day music festival, complete with the utter indulgence of free love, drugs, and rock 'n roll. This signpost of hippie counterculture was originally just supposed to be a three-day summer music festival in August 1969 on a dairy farm just outside of White Lake, New York. It was the brain child of 4 very young men, the oldest being just 27 years old at the time. 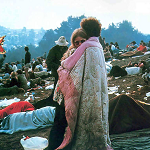 Lets take a closer look at this legendary festival and its story to learn some fascinating facts from Woodstock 69 history. The story began with two new partners came up with an idea to build a recording studio and a sanctuary or hideaway for rock musicians up in Woodstock in New York. As Woodstock was already home to some famous rockers like Bob Dylan, it was decided that the location would be absolutely perfect. They needed to raise extra funding to pay for the retreat, so they decided to host a rock festival over a weekend for 50,000 people. The two new partners came up with an idea to build a recording studio and a sanctuary or hideaway for rock musicians up in Woodstock in New York. As Woodstock was already home to some famous rockers like Bob Dylan, it was decided that the location would be absolutely perfect. They needed to raise extra funding to pay for the retreat, so they decided to host a rock festival over a weekend for 50,000 people. They looked for locations and found a suitable one in an industrial park in Wallkill, New York. They printed tickets with different prices for one day, two days, and three days in total. They started organizing the catering, getting security teams together, and started signing up a line-up of rock 'n roll stars to take center stage. Just when the organizers thought they had found their ideal location, the residents of Wallkill became incensed. They disliked the idea of having a bunch of wasted hippies at a music festival descending on their town. Consequently, the four organizers and their lawyers lost their fight for the venue when the town of Wallkill passed a law in July 1969 completely banning the concert. With just a month and a half to go until the concert, they had lost their venue. Following this signifigant setback, ticket vendors refused to continue selling tickets, musicians pulled out, and what started out as a brilliant idea was falling apart right before their eyes. But at the last minute, dairy farmer Max Yasgur offered his 600 acre dairy farm as a new venue for the Woodstock festival. Without wasting time, contracts were drawn up, permits were acquired, and permission was granted from everyone in the surrounding areas and towns. After they gained all the proper paperwork, they had to build a stage, parking lots, concession stands, a pavilion for performers and a children's playground. They managed to finish everything in the nick of time but they didn't finish the gates or ticket booths in time. The organizers seriously under-estimated the number of concert goers. As things just started coming together, last minute panic ensued. The biggest problem being that the numbers had catapulted from 50,000 festival goers to a whopping 200,000. They needed to get extra food vendors, water, and medical facilities in a serious hurry. Food vendors were pulling out because the organizers had, in their ignorance, hired vendors with absolutely no concession experience. And as if that wasn't bad enough, a last minute ban prevented off-duty policemen from working the festival. These were all setbacks that the organizers didn't need. 50,000 people had already arrived early and were camping around the stage before the organizers could build gates or ticket booths. The organizers realized at this point that they had completely lost control even before the concert started. They were left with no choice but to declare the concert free, which in hindsight rendered disastrous results. Word spread that the concert was now free and, as a result, people started pouring into Bethel onto Max Yagur's field. More than 1 million people arrived and around 500,000 people actually made it to the concert. Highways turned into parking lots, vehicles were being abandoned, and the organizers had to hire last-minute helicopters to get the performers to and from the stage. The incredible lineup of big rock 'n roll names at Woodstock included Janis Joplin, Santana, The Who, Jimi Hendrix, Jefferson Airplane, Creedence Clearwater Revival and The Grateful Dead. The concert was a rip-roaring success that was not dampened by heavy rains or by thirty-minute lines for water, sustenance, and medical care. The biggest music event in history was eventually made into a movie that raked in plenty of money for the organizers who, after the festival, found themselves in a mountain of debt.